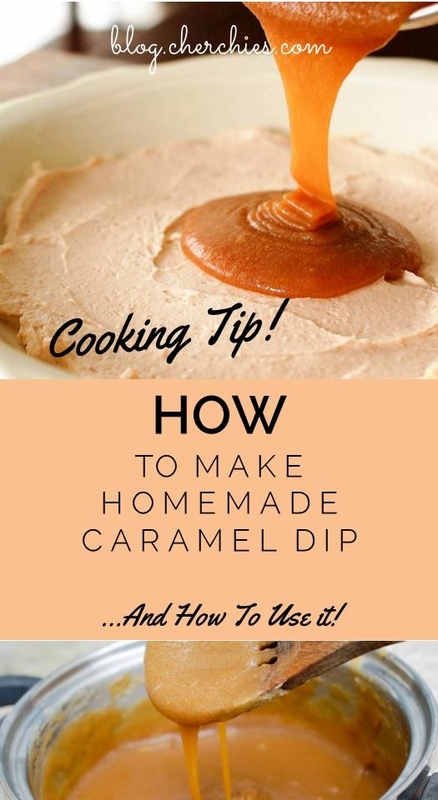 Cooking Tip: How To Make Homemade Caramel Dip…And How To Use it! With Fall in full swing, and the holidays fast approaching, nothing melts our hearts more than dreamy, homemade caramel sauce! Rich, creamy, buttery, caramel…add a pinch of salt and your taste buds will go into overload. It is the perfect compliment to your favorite dessert and beverage; and an absolute necessity for your holiday entertaining. Follow along below as we share the steps of this easy recipe, along with clever ways to use it. What is your favorite use for caramel? We would love to hear from you! 1/2 teaspoon vanilla (you could substitute your favorite liquor for an extra special adult treat…we won’t tell, but make sure to keep away from the kiddos). There seems to be some debate out there in cyber world about making homemade caramel sauce, and whether or not to melt the sugar first with butter or add the butter at the end along with the rest of the ingredients. I have tried both ways with the end result being the same. Quoting my mother, “If it ain’t broke, don’t fix it” (okay, she did not say ain’t, but you get the idea), so this is my version for a creamy, delectable caramel sauce/dip. It really is very easy, and only takes a few minutes. The caramelization process happens quickly, so make sure all your ingredients are measured and in place before you begin. Start with a medium-sized stainless steel sauce pan (ceramic would work just fine too). Add the butter chunks to the pan, turn the heat on low, and gently stir the butter with a wooden spoon (you can use a whisk too) until it melts. Once the butter has melted, add the sugar and continue to stir until the sugar has melted. (Sugar will be HOT! Trust me, and learn from my mistakes, do not be tempted to taste the caramel at any time, until it has cooled! Many sites I researched suggest having a bowl of cold water on hand in case of flying molten sugar. Yikes! Do not be afraid, but be safe.) As you are stirring, scrape the sugar that forms on the side with the spoon or a rubber spatula and incorporate into the mix. Continue stirring constantly on low until all the sugar has dissolved and you have achieved this rich caramel color and a nutty aroma. Some of the butter may remain on the top. This is okay. It will incorporate once the half and half or cream is added. As the caramel comes to a rolling boil on low, continue rapidly stirring. Add salt and vanilla (or liquor) at this time. If you want salted caramel, then add an additional 1/2 teaspoon (tsp) of salt. The last part is the cream or half and half. Add the cream slowly and stir stir stir! Again, be careful, this is where the caramel will get angry with you, as it will sputter and possibly throw molten sugar your way. You must prevail. I’m teasing… it really is very easy! Simply continue stirring rapidly until all the ingredients are incorporated. Remove the caramel from the heat and allow to cool. Turn off the stove. The caramel will thicken as it cools. Look at that! Creamy, dreamy, homemade caramel sauce! You may never buy store-bought caramel again. Stay tuned below for our favorite uses for caramel. Top your favorite cake, pie, or tart with a generous drizzle of caramel. Pour over popcorn and enjoy a sweet treat. Dip apples for a deconstructed caramel apple. Sweeten your coffee with caramel instead of cream and sugar. Rim a mug of hot cocoa for that extra decadent touch. For an adult beverage, rim a martini glass with caramel and serve with your favorite Appletini. Make hot caramel apple cider. Place in a pretty jar, tied with a pretty ribbon and give as a gift to your favorite hostess, teacher, family or friend. Bake with Brie and nuts and serve with apples for a festive appetizer or dessert. Make it savory! Mix with fish sauce and a few other ingredients for flavorful Vietnamese dishes. Food and Wine.